YAY! It's Recipe Club Day!!! Since I've been all about "Back To School" lately, I thought I'd share one of my favorite festive recipes... Apple Spice Cupcakes with Brown Sugar Cream Cheese Frosting. After the cupcakes were cool, I whipped up the icing. I beat together two sticks of unsalted butter with an 8oz package of cream cheese. Once those were creamed together, I put in 1/4 cup of packed brown sugar, 2 teaspoons of vanilla extract and 4 cups of powdered sugar. I don't put tons of icing on them, but just enough for a bite. I hope y'all enjoy the cupcake recipe and if you whip some up for back-to-school (or for breakfast.... because they totally count as a fruit! ), send me an email or tag me on IG and let me know how much you're obsessed with them (because you WILL be obsessed!). Don't forget to link up your recipe(s) as well! I always love it when you make these cupcakes!! And I loooooooove that we're already in the "back to school" spirit of things! These look tasty! Thanks for hosting! Great recipe! Where do you get your flour/sugar jars!? Would you recommend them!? I keep all of my flour/sugar in the bags in the pantry and I think these look so cute! You made cookies and cupcakes in one day. How in the world are you not 2,000 pounds? but seriously, I want a cupcake WITH CREAM CHEESE FROSTING right now. RIGHT. NOW. And that mess? G standing in it was so flipping cute! Oh my goodness those look fabulous! 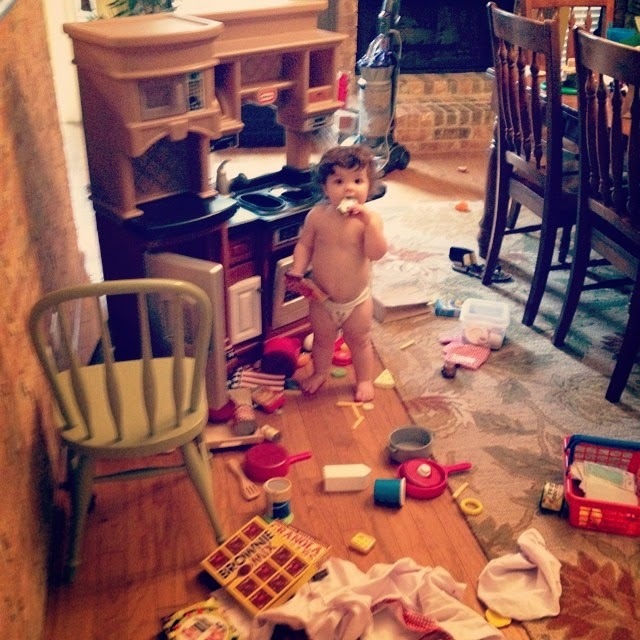 Poor little sister how funny that she is left with the mess; that picture was precious. These look delicious!!! I love how you take us through step by step and show all your ingredients when baking...really helps when you begin the process yourself! Thanks for sharing! Yay you shared your frosting recipe! Is it me or does that frosting look just heavenly?!!! This is coming from a person who does not like frosting. Thanks for the recipe, will be making these tonight since i have all the ingredients. These look so good! Can't wait to try them! These look so yummy! I can not wait to try them. Rainy day = baking day at home. I can't wait to try these! What a good idea putting the icing in a baggie! Oh I will have to try these and the part where your boys scattered leaving G to fend the clean up on her own made me laugh. So cute. These sound so yummy and would be perfect for fall! These muffins look so yummy! They look like they would be a perfect little snack for the kiddos. Can't wait to try them out! Yum! I like how you make them mini...totally means you can have more :) And a great size for kids. I love your super fancy piping bag...that's how I do mine also. I'll have to make these and will be sure to tag you. Those look amazing! I can imagine myself eating those for breakfast and before bed..really just at any point throughout the day! I made these tonight (as my youngest just went back to school today) and... Oh. My. Word. They are divine! I put some in the freezer to test how they freeze as this definitely made more than we needed! Thank you! I so love to see recipes with no additives and preservatives and it makes me feel better about letting my kids pop an extra one (or two) in their mouth. Yum! Those cupcakes sound amazing and the piped icing adds the perfect touch. :) Thanks for sharing!! Andrea -I made these last weekend and they were a hit! Wonder if I can substitute mashed bananas for the applesauce? I have a few mushy bananas to use up and looking for a twist on banana bread.